Jumbo bag filling machine can be used for packing bulk materials into ton bags, which not only save a lot of human resources, but also improve the efficiency of the packaging work. With the expansion of industrialization, the jumbo bag filling station has been widely used in the fertilizer, pharmaceutical, metallurgy, agriculture, construction and other related industries, as welcomed by the industry and efficient packaging equipment. 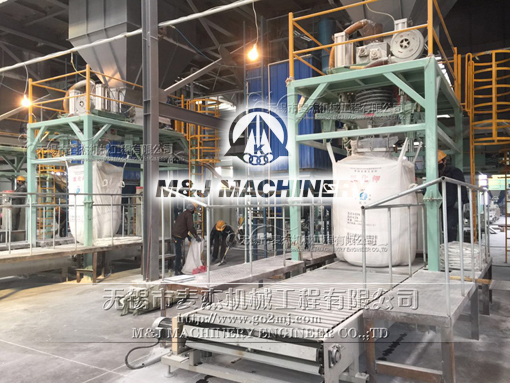 M&J Machinery has been manufacturing the jumbo bag filling systems for 15 years, in addition to master the technology, we also developed the jumbo bag filling machines on this basis for the development of innovation, to meed different clients’ requirement. In the traditional production, jumbo bag filling machine usually has a strict production standards. Standard production of jumbo bag filling stations can really reduce the difficulties of manufacturing, but it makes the customer in the actual use of the process has been limited. Rather than standard custom production is different from the traditional standard production of a new road, it can a considerable extent to meet customer demand for jumbo bag filling machine, whether from the device height, equipment weight, machine material, etc., Can really achieve the "on-demand design, customized production", we M&J Machinery ensures that each jumbo bag filling system can be fully applicable to the environment will be working to ensure that customers buy a real fit to meet the needs of the perfect equipment. Our sales Engineers are online 24 hours for you!